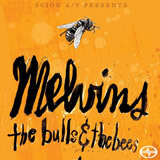 What do Melvins records and buses have in common? Wait for one and two show up at the same time. Also they’re both massive, they’re both slow and would both crush you if you got in their way. The venerable sludge/grunge pioneers will soon be treating us with their next album proper, the charmingly titled Freak Puke under their new Melvins-Lite moniker but before that though we have this little beauty of a free EP brought to us by the lovely folks over at Scion A/V. For those who don’t know, Scion Audio/Visual is the record label department of, bizarrely, the North American branch of the Toyota Motor Corporation – apparently these dudes love their cars to be chunky and reliable, and their music to be slow and dirty. Well luckily it’s a marriage made in heaven because you could describe the music on The Bulls and the Bees as “chunky and reliable” too. The Melvins are in full-on Kiss-inspired pomp mode here and, surprisingly, this is a great thing for the most part. All of the songs – barring one (more on that later) – are extravagant and fun, even with titles like “We Are Doomed”. Lead single (or the one they bothered to make a video for and play on National TV) “War on Wisdom” comes in with Dale Crover’s clattering drums before AC/DC, Kiss, and even Queen are channelled and filtered through the Melvins’ characteristic rhythmical chug. It’s a triumphant start to the EP, so triumphant in fact that by the time the middle eight comes a-knockin’ King Buzzo sounds like he’s joined Crosby, Stills, Nash and Young. Imagine that! Crosby, Stills, Nash, Young and Buzzo. It has a kind of awkward ring to it. Second track “We Are Doomed” is also a complete belter and it’s the song that comes closest to introducing danger into the mix, the lengthy outro containing a certain Melvins menace that isn’t found anywhere else on this brief EP. “National Hamster” is great too, even if it reminds me of “Now I’m Here” by Queen. But it’s “A Really Long Wait” that is the real surprise here – a beautiful, sombre, choral piece with a mixed orchestra of strings and guitar feedback. I’m certain King Buzzo has never sounded sweeter. In fact the vocals throughout the EP are massive, Buzzo’s booming voice taking centre stage amongst the often lush backing vocals.